Tesla Death Ray Gun finally comes to life? As you all know, Nikola Tesla was a very smart man. He had the ability to conceive, design, build, and test a new invention completely in his mind. As early as 1934, Tesla was telling the world about his death ray. Of course, most people back then thought he was half crazy - and his far out idea of a death ray machine probably did not help matters much. Of all his inventions, the Tesla Death Ray probably propelled him into the world of science fiction faster than anything else. The way I see it is... Tesla was just way ahead of his time. And, wouldn't you know it, time has finally caught up to old crazy Nikola! We all forget about the fact that every time we flip on a light switch or turn on a radio, we are using one of Tesla's inventions. 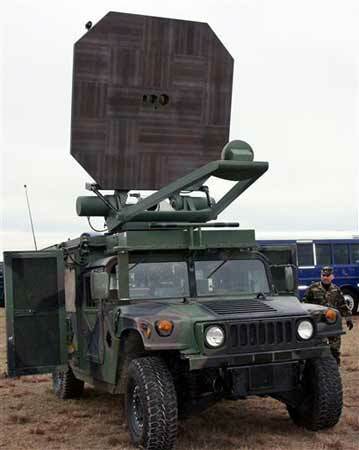 Maybe some of you have seen the new ray gun built by Raytheon - it's called an "active denial system". It was featured on 60 Minutes a few weeks ago. OK... maybe it is not exactly the same technology as Tesla's, but it is a ray gun. I think Tesla was trying to use some kind of particle beam technology and the new Raytheon system probably uses microwaves. But... you have to give Tesla credit for being one of the first to come up with the idea! MOODY AIR FORCE BASE, Ga. (AP) -- The military calls its new weapon an "active denial system", but that's an understatement. It's a ray gun that shoots a beam that makes people feel aactive denial systems if they are about to catch fire. Apart from causing that terrifying sensation, the technology is supposed to be harmless -- a non-lethal way to get enemies to drop their weapons. Military officials say it could save the lives of innocent civilians and service members in places like Iraq and Afghanistan. The weapon is not expected to go into production until at least 2010, but all branches of the military have expressed interest in it, officials said. The device's two-man crew located their targets through powerful lenses and fired beams from more than 500 yards away. That is nearly 17 times the range of existing non-lethal weapons, such as rubber bullets. Anyone hit by the beam immediately jumped out of its path because of the sudden blast of heat throughout the body. While the 130-degree heat was not painful, it was intense enough to make the participants think their clothes were about to ignite. The system uses electromagnetic millimeter waves, which can penetrate only 1/64th of an inch of skin, just enough to cause discomfort. By comparison, microwaves used in the common kitchen appliance penetrate several inches of flesh. The millimeter waves cannot go through walls, but they can penetrate most clothing, officials said. They refused to comment on whether the waves can go through glass. The weapon could be mounted aboard ships, airplanes and helicopters, and routinely used for security or anti-terrorism operations. "There should be no collateral damage to this,'' said Senior Airman Adam Navin, 22, of Green Bay, Wis., who has served several tours in Iraq. Navin and two other airmen were role players in Wednesday's demonstration. They and 10 reporters who volunteered were shot with the beams. The beams easily penetrated various layers of winter clothing. The system was developed by the military, but the two devices currently being evaluated were built by defense contractor Raytheon. He came to the idea of a beam of force, he said, because of his belief that no weapon has ever been found that is not as successful offensively as defensively. m e perfect weapon of defense, he felt, would be a frontier wall, impenetrable and extending up to the limits of the atmosphere of the earth. "The plane is thus absolutely eliminated as a weapon; it is confined to commerce. And a country's whole frontier can be protected by one of the plants producing these beams every 200 miles. Nor should they be much more costly than an ordinary power plant..
"These effects,. he said, "are of the kind that can be calculated with the most positive accuracy. Like many other things I have done they require no previous experiment once they are properly conceived. There are a few details to be finished - my calculation might be perhaps 10 per cent off at present - and then the whole thing will be presented to the world. It has always been my practice to give the world a sort of preview of what I am doing so that a reception is prepared." Dr. Tesla was far less definite in his description of the experiments which led to his revolutionary prediction of the future of the sun and its system than he was when talking of the force beam. He had, he said, detected "certain motions in the medium that fills space, and measured the effects of these motions.. The results of the experiments had led his "inescapably" to the conclusion that such bodies as the sun are taking on mass much more rapidly than they are dissipating it by the dissipation of energy in heat and light. Finally there was the electric bath. The idea of a bath of electricity to cleanse the person far more completely than water ever could has always been at the back of Dr. Tesla's mind. Many years ago he built a machine which performed the function successfully, but, because it cost too much and was not without its dangers, he dropped it as impractical. Lately he has improved it so much that he feels it is now fit for general use. Nikola Tesla, one of the truly great inventors who celebrated his eighty-fourth birthday on July 20, tells the writer that he stands ready to divulge to the United States Government the secret of his "teleforce," with which, he said, airplane motors would be melted at a distance of 250 miles, so that an invisible Chinese Wall of Defense would be built around the country against any attempted attack by an enemy air force, no matter how large. This "teleforce," he said, is based on an entirely new principle of physics that "no one has ever dreamed about." different from the principle embodied in his inventions relating to the transmission of electrical power from a distance, for which he has received a number of basic patents. This new type of force, Mr. Tesla said, would operate through a beam one one-hundred-millionth of a square centimeter in diameter, and could be generated from a special plant that would cost no more than $2,000,000 and would take only about three months to construct. A dozen such plants, located at strategic points along the coast, according to Mr. Tesla, would be enough to defend the country against all possible aerial attack. The beam would melt any engine whether Diesel or gasoline-driven, and would also ignite the explosives aboard any bomber. No possible defense against it could be devised, he asserts, as the beam would be all-penetrating. The beam, he states, involves four new inventions, two of which already have been tested. One of these is a method and apparatus for producing rays *** of energy *** eliminating the *** high vacuum; the second is a method and process for producing "very great electrical force"; the third is a method for amplifying this force, and the fourth is a new method for producing "a tremendous electrical repelling force." This would be the projector, or gun, of the system. The voltage for propelling the beam to the objective, according to the inventor, will attain a potential of 50,000,000 volts. With this enormous voltage, he said, microscopic electrical particles of matter will be catapulted on their mission of defensive destruction. He has been working on this invention, he added, for many years and has recently made a number of improvements to it. After all, $2,000,000 would be relatively a very small sum compared with what is at stake. If Mr. Tesla really fulfills his promise the result achieved would be truly staggering. Not only would it save billions now planned for air defense, by making the country absolutely impregnable against any air attack, but it would also save many more billions in property that would otherwise be surely destroyed no matter how strong the defenses are as witness current events in England. Take, for example, the Panama Canal. No matter how strong the defenses, a suicide squadron of dive bombers, according to some experts, might succeed in getting through and cause such damage that would make the Canal unusable, in which case our Navy might find itself bottled up. Considering the probabilities in the case even if the chances were 100,000 to 1 against Mr. Tesla the odds would still be largely in favor of taking a chance on spending $2,000,000. In the opinion of the writer, who has known Mr. Tesla for many years and can testify that he still retains full intellectual vigor, the authorities in charge of building the national defense should at once look into the matter. The sum is insignificant compared with the magnitude of the stake. "If only they will let me try out my new teleforce'. exclaimed Nikola Tesla, who has been called one of the greatest electrical inventors since Benjamin Franklin flew his kite. "If only they will let me show how this Nation can be made invulnerable to air attack!. Four recent inventions, Tesla says, are used in the generation of the ray. Two of them already have been tested, it is said. One of these is an apparatus for producing rays "and other manifestations of energy. in free air, instead of in a vacuum. The second is a process for producing "A very great electrical force.. Next is a method for amplifying this force and finally there is a new method for producing "A tremendous electrical repelling force.. This, Tesla declares, would be the projector, or gun, of the teleforce system. It would operate on a potential of 50,000,000 volts. All this, Tesla says, he is offering to the United States, the land which welcomed him as an immigrant boy from Austria-Hungary in 1884. But there must be no "red tape," if he is to go to work setting up the first power plant. There must be no "interference from experts.